Another interesting photograph well worth sharing on our Help Pages as a vehicle identification aid, and found while surfing the internet in the process of researching ancient machinery. Can we name the make? -- Made in USA in Toledo, Ohia, by the American Bicycle Company (see HP 03), then one of USA's largest cycle manufacturers. This is a cca 1901 Toledo Model B Steamer 6.24HP Twin, with unusual condensing radiator. Condensing radiators were compulsory in the UK, not standard in USA. Another interesting photograph well worth sharing on our Help Pages as a vehicle identification aid to automobile historians, found while surfing the web researching unknown machinery. Can we name make? -- The large high radiator suggests it is a steamer built in Cleveland Ohio by the White Motor Company. No discernable side to the radiator suggests this was the cca 1906 White Model E Steamer. President Taft had a steamer in 1911, after which they changed to petrol driven cars. Another interesting photograph well worth sharing on our Help Pages as a vehicle identification aid to automobile historians, found while surfing the web researching unknown machinery. 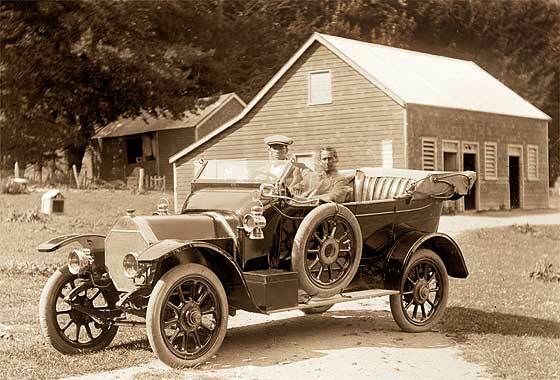 Noted on many websites as a Model T. -- Not a Model T ! 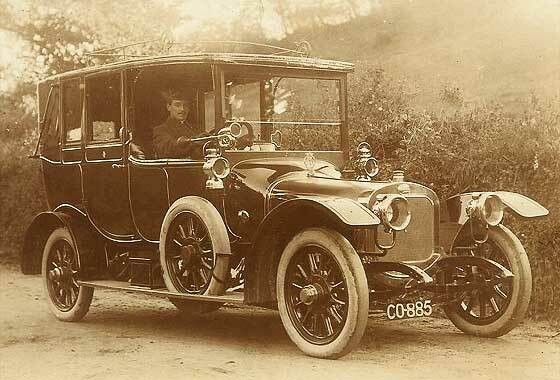 It is a Ford, but it is one from the earlier Model N range built 1906 to 1908. 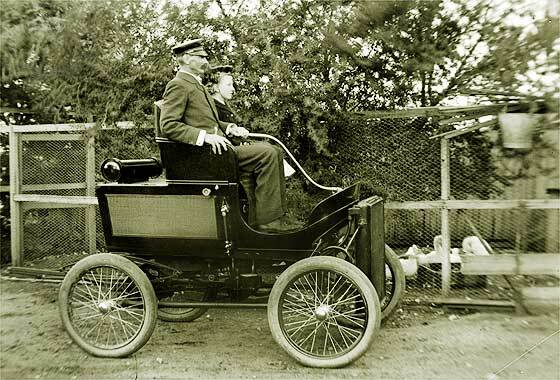 As this one has a running board it is a cca 1907 Ford Model R Runabout, front engined 4-cylinder 2.4 litre 15 HP engine at US$750 and available in dark green, 2500 built. 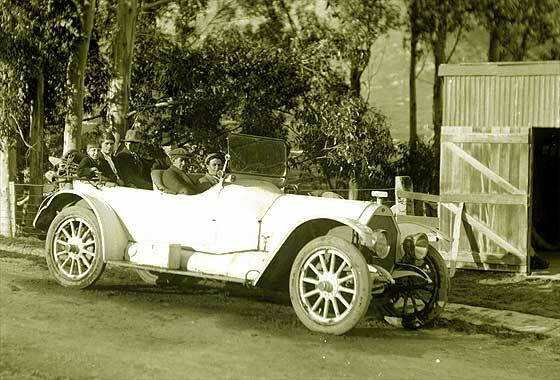 Lovely photo received from Amanda Wlson (Australia) of Great, Great Grandfather's car. The photo was taken in Bega, NSW, Australia. Not sure what year or what type of motor vehicle. Any help would be great. -- Not had one for months, then three on the same page! This is a cca 1909 BSA Two-Seater, probably 15'20, with rather an unusual body and a rather unusual waterproof cover over where the Dickey seat would be at the back. Perhaps coachbuilt area for specialist equipment/cargo. Another rather splendid photo received from Mark Dawber (New Zealand) investigating a photo which seems to be notated as 1910. He thinks car in the showroom window is a 1926 or '27 Oakland? -- Well spotted! The car in the window is showing a bit of the humped radiator and also the headlamps with the distinctive swirly glass pattern of the lens. 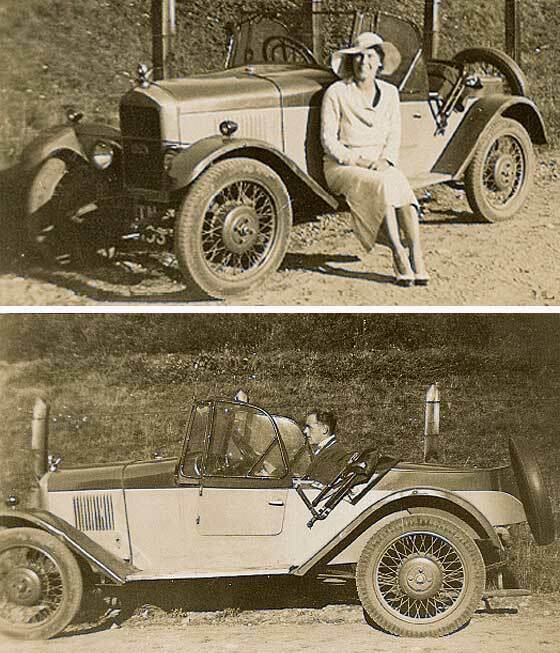 The two together suggests the car is a cca 1926 Oakland Greater Six. The front car is a British cca 1910 Daimler Tourer, probably 25HP. Another rather splendid photo received from Mark Dawber (New Zealand) investigating a vehicle which is unidentified on more than one website. Can we help with advising name of manufacturer. -- This one has created much head scratching as it seems to have a rose emblem badge on the radiator? Our Ariejan Bos is sure it is a British BSA but not sure of model. If so, probably the cca 1912 BSA 15'20 Tourer. BSA logo was three guns (similar to HP 20 ). Still looking for a badge with a rose! One of a number of interesting photos sent to us by Andrew Kostin, Moscow (Russia). 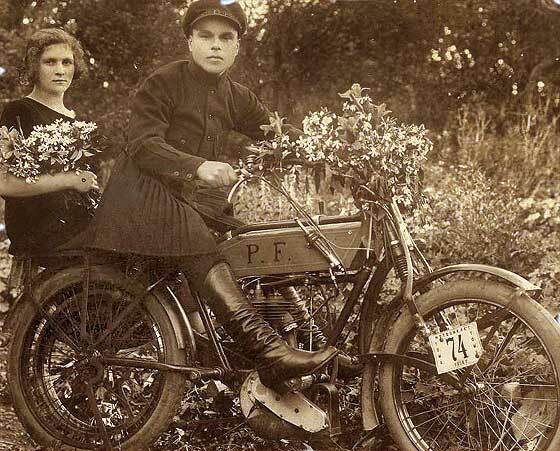 Can we identify unknown motorcycle in 1926 USSR. -- Difficult as we do not have view of an exact comparison. Primary identification feature is the unusual Truffaut front forks used by various makes. Main contender is French Peugeot from the initials on the tank (but Peugeot Freres engine mainly twins?). Also German Allright (sold in UK as Vindec: engines FN, Peugeot and JAP) has the same features. Another interesting photograph well worth sharing on our Help Pages as an identification aid, and found while surfing the internet in the process of researching ancient vehicles. Can we name the make/s? -- Photo believed from New Zealand and therefore this group of vehicles is a very curious bunch. One Brit and two Germans. On right is relatively unusual car being a cca 1911 Brennabor 5'12 Tourer made by Europe's largest pram manufacturer. Cars ended 1933, was Soviet Zone 1945. Another interesting photograph well worth sharing on our Help Pages as an identification aid, and found while surfing the internet in the process of researching ancient vehicles. Can we name the make/s? -- Photo is believed from New Zealand and therefore this group of vehicles is a very curious bunch. One Brit and two Germans. The British car has a a big star on the radiator suggesting this is a cca 1912 Star 10'12 Tourer made in Wolverhampton from 1898 to 1932. Became GUY. Another interesting photograph well worth sharing on our Help Pages as an identification aid, and found while surfing the internet in the process of researching ancient vehicles. Can we name the make/s? -- Photo believed from New Zealand and therefore this group of vehicles is a very curious bunch. One Brit and two Germans. The one in the middle is very unusual car built by NAW in Hamlen in North Saxony, who built Colibri and NAW. This is a cca 1913 Sperber F4 6'20 Doppelphaeton. 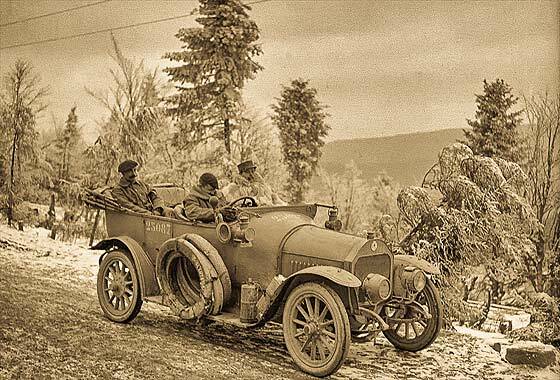 Interesting photo received from our Michel Gosset (France) investigating on behalf of one of our Members the history of a car he currently owns but which was used in WW1 by Général Berdoulat of the Battle of the Somme fame. -- This photo shows the General in a fur coat sitting beside a freezing chauffeur and with a frozen aide in the back. 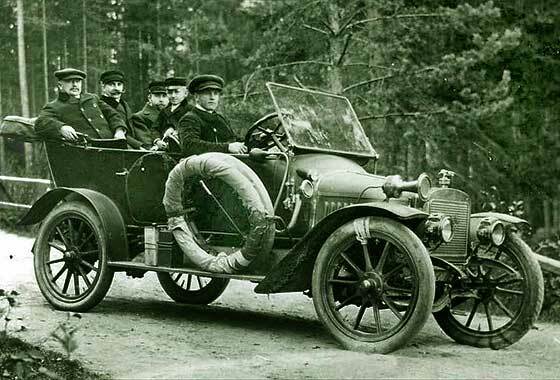 The car is a cca 1913 Berliet AM3 15HP Torpedo. Berliet cars were made in Lyon from 1894. In 1906 Berliet sold licence to American ALCO. Continuing background from our Michel Gosset (France) investigating on behalf of one of our Members the history of a car he currently owns, used in WW1 by Général Berdoulat of the Battle of the Somme fame. -- This postcard shows the Berliet many years later, c1961, when owned by a scrap dealer known to Michel at Chateau de la Cordiere Museum, card notated " ..as owned by General Bedoulat, Grand Quartier General of Petain at Verdun. Automobile Museum South West - Lucien Mette." 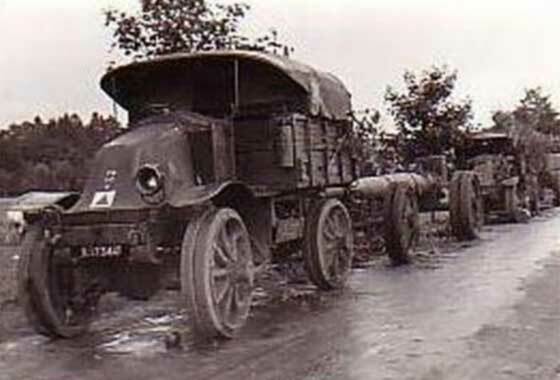 Interesting photo received from our Michel Gosset (France) investigating on behalf of one of our Members the history of a Berliet AM3 car he currently owns but which was used in WW1 by Général Berdoulat of the Battle of the Somme fame. 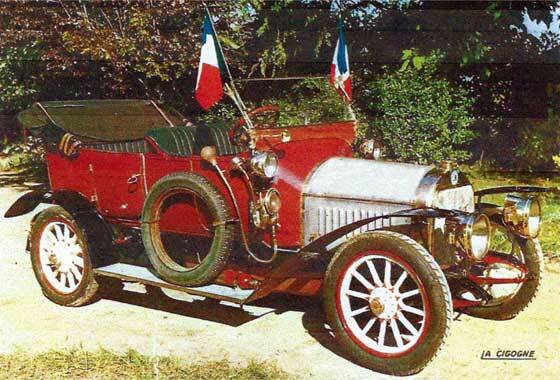 -- This photo was associated with the researches on the Berliet and Michel wondered if it was a Delaunay Bellville. No, it is a cca 1913 Hotchkiss AD20 Phaeton. Delaunay had fully circular rads. Hotchkiss had the flat at the bottom. Another rather splendid photo received from Mark Dawber (New Zealand) investigating an unidentified vehicle found on the internet. Can we advise if this photograph has been reversed and can we name make? -- Very close up investigation reveals the sign on the rad cap is reversed and car is LHD. When flipped, sign is right and car is RHD suitable for Antipodes. 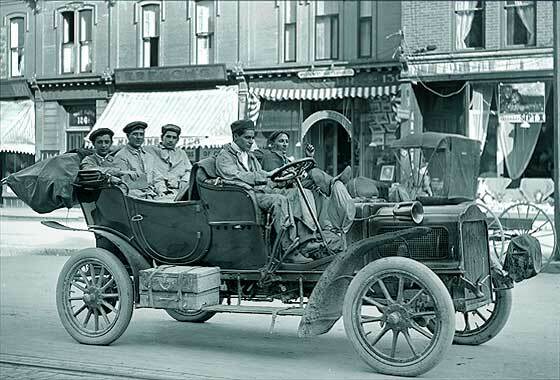 The car is American, built in Racine, Wisconsin, and is a cca 1913 Mitchell Touring, poss a Model 5-4 40, or 5-5 50hp. 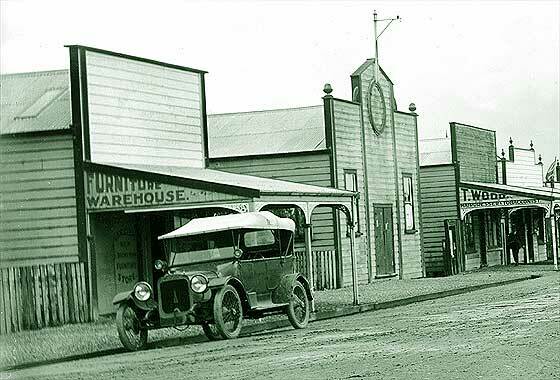 Another rather splendid photo received from Mark Dawber (New Zealand) investigating a vehicle which is unidentified on more than one website. Can we advise if car believed photographed in New Zealand is a BSA? -- BSA was a British company 'Birmingham Small Arms Co' founded 1861 that made guns, bicycles and later motorcycles and cars, that purchased British Daimler in 1910. 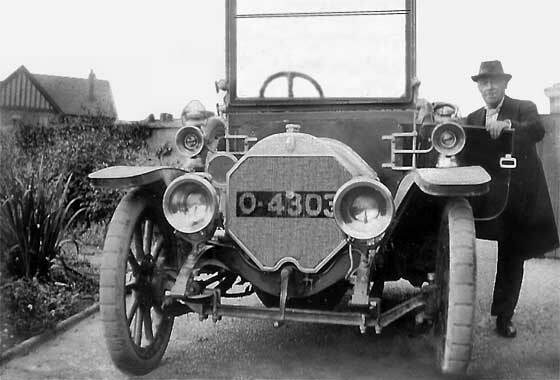 Car seems to have three guns logo on the radiator so is a cca 1913 BSA 13.9HP Crichton Tourer. Lovely photo received from David Oborn (UK) of chauffeur Grandfather William Leonard Oborn taken in 1914 at Beer, East Devon. Later owned a Landaulette offered for hire and then started a Garage. Would like to know the make/model of car registered at Plymouth, but index card for CO 885 is sadly missing. -- CO 885 was indeed Plymouth CBC but no available dating records pre 1921 when 3750 was reached. Could be a 'cherished plate' because this is a cca 1913 Sunbeam 12'16 Landaulette. Another interesting photograph well worth sharing on our Help Pages as a vehicle identification aid, and found while surfing the internet in the process of researching unknown machinery. Can we name make? 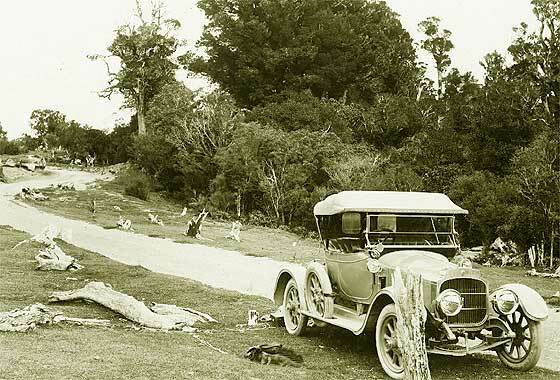 -- The photo was notated as Napier on the Taupo Road. Not a Napier, but is a British car, made in Luton, designed by Laurence Pomeroy, and was the first 20HP car to exceed 100mph. 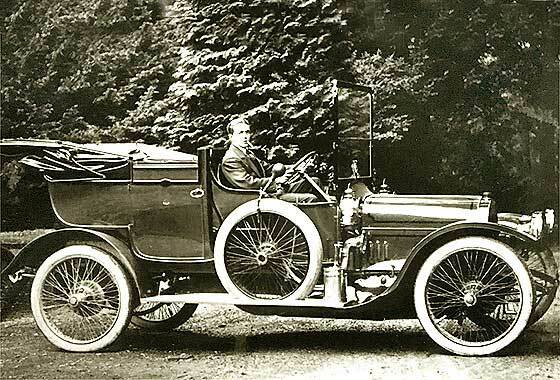 This is a cca 1913 Vauxhall A Type Ascot A12 Two-Seater Torpedo. Vauxhall A's made 1908 to 1915. Another interesting photograph well worth sharing on our Help Pages as a vehicle identification aid to automobile historians, found while surfing the web researching unknown machinery. Can we name make? -- It seems the car was possibly photographed in Jamsa Finland. It was however manufactured in Frankfurt, Germany, and is a cca 1914 Adler 12'30 Phaeton. Adler became known for their front wheel drive Trumpf models in 1930/40s. Motorbikes post WW2, and later office machinery. Another interesting photograph well worth sharing on our Help Pages as a vehicle identification aid, and found while surfing the internet in the process of researching unknown machinery. Can we name the make? 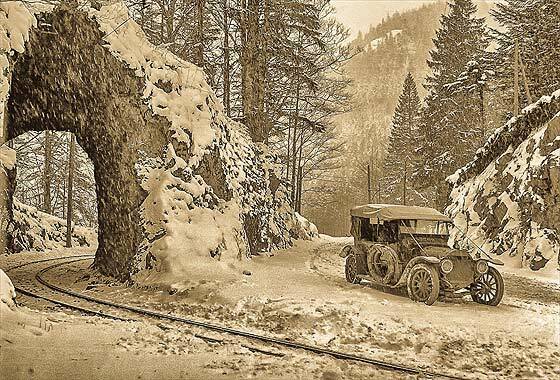 -- The photo was notated WW1 Latil, 1898 to 1955, a French four-wheel truck introduced 1911. We are relatively sure this is another French make with a similar scuttle radiator. 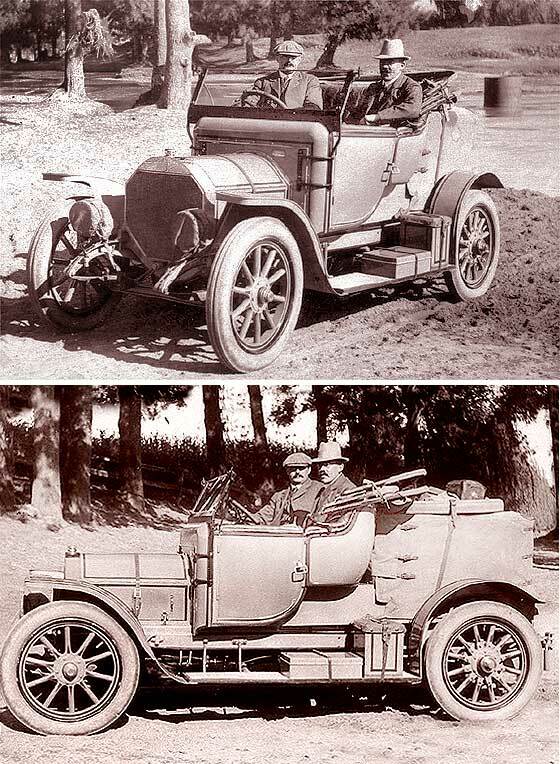 Rad suggests a 8.5L cca 1916 Renault EG Four Wheel Drive Truck introduced 1915, 978 built. 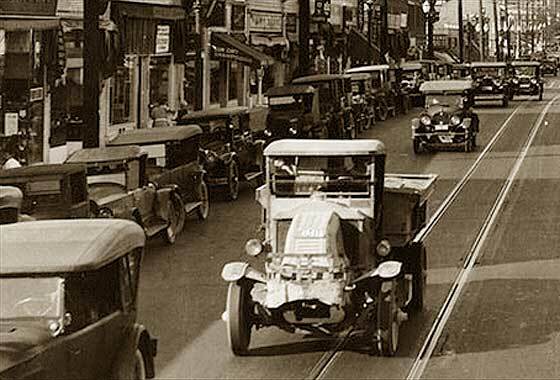 Another interesting photograph well worth sharing on our Help Pages as an identification aid, and found while surfing the internet in the process of researching ancient vehicles. Can we name the maker? -- Number of manufacturers in the USA used bulkhead radiators on commercial vehicles, MACK probably the best known. From horisontal louvres on front, this however is the lesser known cca 1919 Kelly Springfield Truck, probably larger K50/K60. Company finished C1929. Another interesting photograph well worth sharing on our Help Pages as a vehicle identification aid, and found while surfing the internet in the process of researching ancient machinery. Can we name the manufacturer? -- Rather lovely and very curious photo of a tractor pulling a motorcycle sidecar. 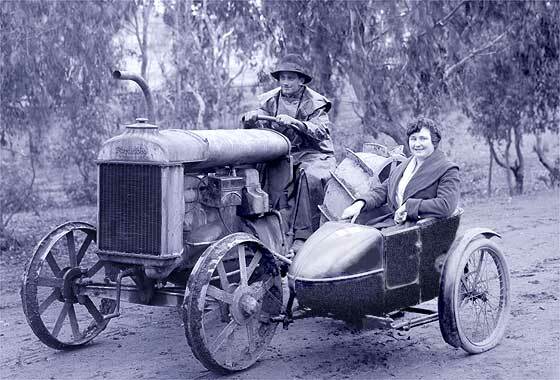 The tractor is pre-1924, cca 1921 Fordson Model F made by Henry Ford in America, Ireland and UK. Although cute, the photo seems posed, as the sidecar is hard wired to the front spoke! 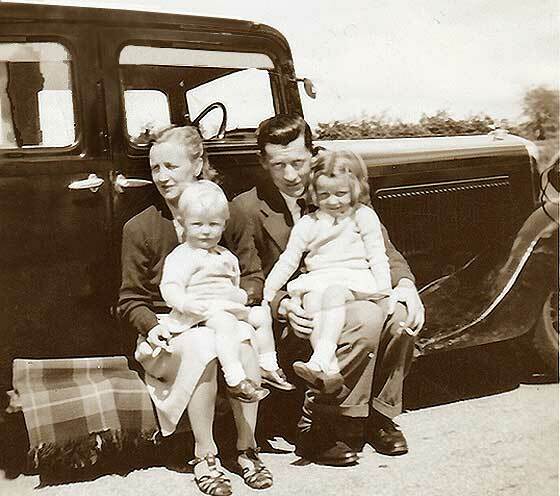 Couple of lovely photos received from Richard Perrin (UK) of his father and mother in their car in 1933. He understands it was a Singer Boat tail. Can we confirm? -- Yes to both Singer and boat-tail, but boat-tail body is normally very pointed at the back; this one has a dickey seat and spare tyre there. Rather special car named after the 100 ascents of Porlock Hill Somerset in 1928 by a Singer Junior 8HP Sports 2-seater. A new model appeared in 1929 to celebrate, called the " Porlock Sport ". 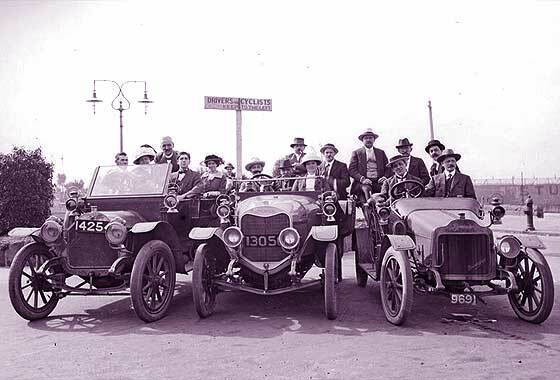 An unusual period photo received from Alun Pugh of Leeds (UK) saying "You have helped me ID many postcards of classic cars in the past but here`s something unusual.... a negative. Any ideas? -- We have inverted to positive and added tone. Registration is UP 4### which is Durham County Council late 1930. 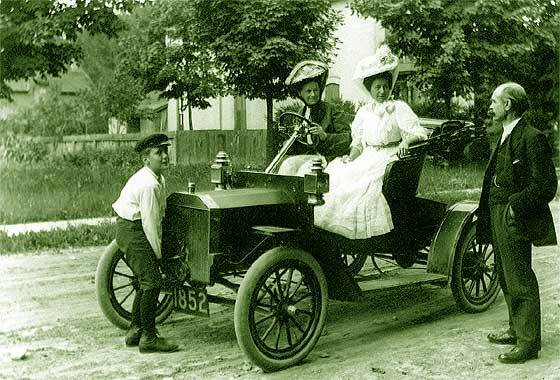 The car was made by a company that started in 1887 making bicycles in Coventry, motorcycles in 1897 and cars in 1921. This is a cca 1930 Triumph Super Seven 7.9 Fabric Saloon. Not a very helpful photo received from Les Robbins (UK) taken in July 1947 probably in the UK, but possibly in Australia; it is an old family picture. Is it unusual to have the handles next to each others?-- No, quite common, as were the other permutations. Car looks British from the window wind deflectors, and identified by our Tony Oakes as a cca 1935 Morris 20 Cowley Saloon. Numerous very thin louvers suggest the not-before year. Various differing Cowley models made 1915 to 1958. Relatively recent photo received from Charles Dagenais (France) asking if we can identify the car, please, from a video screen capture at The Chantecler, a Laurentian ski resort, north of Montreal, during winter 1955-1956.-- American make probably built in Oshawa, Canada. 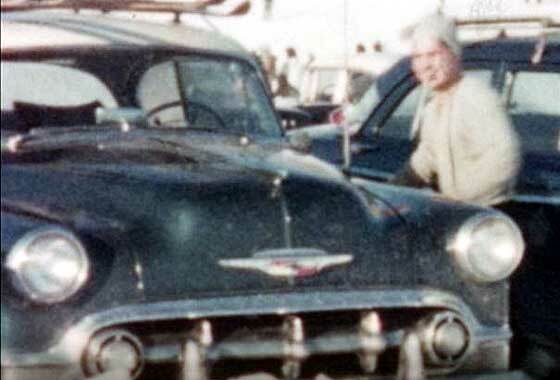 The primary identification feature is the the three vertical bars in the grille signifying this is a cca 1953 Chevrolet 210, probably a two door sedan. From only a partial photo it is difficult to be precise on the exact model. 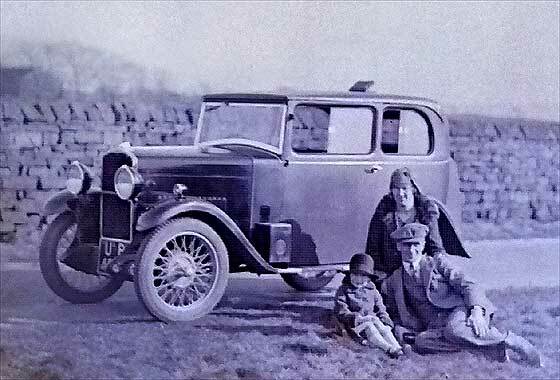 Puzzling photo received from Caryl Bowles (Mrs) (UK) saying "I am a member of Gargrave Heritage Group and wonder if you could identify the car in the photo? -- Looks relatively easy but it has so far beaten all our wise sages. None have been able to give a definitive identification. Wheels are of Riley Detachable type used in UK and Europe, including by De Dion. Feel is French and Leon Bollee has been mentioned. Two of our experts have also mentioned the French Gregoire independently.